The largest CRT show here is from a small computer. The other two tubes are from video camcorder viewfinders. The pencil gives a reference to the actual size of the tubes. The smallest tube was phased out quickly by the use of liquid crystal displays (LCD). All tubes shown here employ electro-magnetic deflection. The coils have been removed for the image. A very early 1950s electron gun from a black and white television tube is shown below. These early tubes used permanent magnets for focusing and bending the electron beam to avoid burning of the fluorescent coating on the tube face. Today burning is prevented by an aluminium coating behind the phosphor which conducts heat away. Most of the burning on early tubes was due to heavy ions hitting the screen. These would not deflect as much as the electrons and would impact the centre of the screen damaging the fluorescent coating. A bend was introduced to the electron gun and a small magnet was placed on the neck of the tube so that the electrons would be deflected down the final electron gun anode. The heavier ions would not deflect as much and would harmlessly hit the anode wall. In the 1960s electrostatic focusing was introduced. This removed the need for bulky ceramic magnets and reduced the length of the tube neck. The focusing anode can be seen in the centre of the electron gun below. 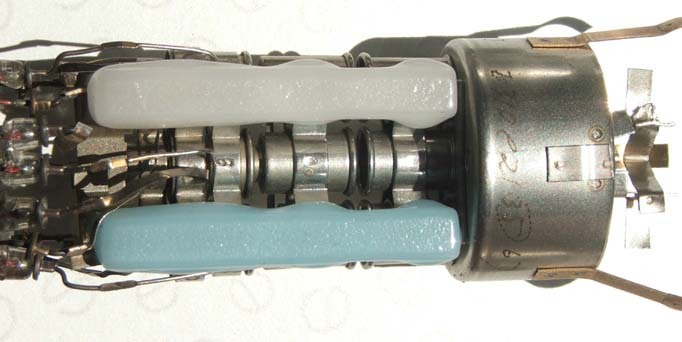 The metal fingers at the right of the gun connect the final accelerating anode to the conductive coating inside the tube (aquadag). The final anode voltage on a typical monochrome CRT is 15kV. At this voltage a separate connector is required to avoid insulation break down. The ring in front of the anode is a geta. This contains reactive elements which help to maintain a good vacuum during the life of the CRT. Early colour CRTs were introduced at the end of the 1960s. These were much more complex than the monochrome tubes. Three electron guns were now in the neck of the tube and a shadow mask was required to ensure beam alignment with the correct colour phosphor (red, green, blue). Early assemblies are known as delta electron guns due to the triangular arrangement of the three guns. Complex static electro-magnetics were set-up around the gun so that the beams converged properly onto the screen. A close-up of the shadow mask is shown on the right. This was used for the delta gun and later in some high resolution monitors with in-line guns. Note the holes on the back of the mask are smaller in diameter than on the front. The mask is shown as it would be viewed through the screen. Arranging the electron guns in a line, in the 1970s, simplified the external electro-magnetic assemblies and reduced the power consumption of the television. It complicated the deflection coil assembly which had now to be set-up and glued to each CRT. The shadow mask appeared with small vertical slots where it had previously been round holes with the delta gun arrangement. A close up of the in-line shadow mask is shown on the right. The shadow mask sits right behind the face-plate or screen on which the phosphors are painted. The mask is held by a frame which is attached at four points on the side walls of the face-plate. A complete shadow mask can be seen in the items page. Simplifying the electrostatic optics resulted in one gun assemblies with three electron beams. This is how the CRT has evolved to date. With the popularity of LCD televisions the CRT market is now shrinking. Parts of a modern colour CRT electron gun are shown below. Sony brought out their own system, the Trinitron. This is similar to the 'in-line' gun but used the same electrostatic-optics for focusing the three beams. 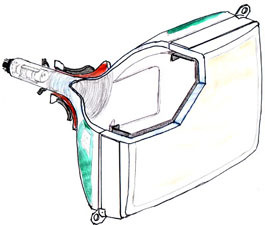 The gun assembly incorporates a potential divider connected to a more complex anode focusing arrangement. The tube face-plate was cylindrical and not spherical as in normal television CRTs. The Trinitron did not use the conventional 'shadow mask' but a vertical 'aperture-grille'. This improved picture brightness as more electrons pass through and hit phosphor. The 'aperture-grille' is delicate and has to be held in tension by a strong and heavy internal frame. In large high resolution monitors, two additional fine support wires are just visible running across the screen holding the grille wires steady. The video link shows a Trinitron tube being dismantled in more detail. The gun on the right is from a vector scanned display used in a Marconi radar system. This was a monochrome display with green phosphor. Similar to televisions, this CRT employed electromagnetic deflection coils on the neck of the tube. The next electron gun is from a monochrome tube manufactured by Brimar (Type: 22B/08L3M) It had a long neck for external focusing and deflection coils. Electrostatic deflection is rare in most CRTs other than tube used in Oscilloscopes. The electron gun below is from a HP Oscilloscope (tube# 5083-0652). The X and Y plate assembly can be seen. The end anode has a fine gauze which was used to intensify the image on the screen. The gun below is from a Tektronix analogue storage oscilloscope. The tube contains a secondary set of guns known as flood guns which are used to preserve the image written by the main gun on the screen. The flood guns are shown on the right. There are two heater, cathode, and anode gun assemblies mounted onto metal support which was fitted to the tube cone just in front of the main gun assembly. The picture on the right is of a gun from a digital storage oscilloscope. This CRT had a problem of leakage between the deflection plates and the final anode. It appears that a getter was over-fired during manufacture. Part of the metal ring has evaporated, coating the glass supports with metal. A leakage path between one of the x-deflection plates and the anode has been created. The metal shading on the supports behind the getter ring is visible in the image. The electron gun on the right is from an electron diffraction CRT. This is a tube used to demonstrate physics principles in schools and universities. This is one of my favourite experiments as it shows an electron beam behaving as a wave, thus demonstrating wave particle duality. The anode in this tube is the electrode furthest right. There is a centre aperture which electrons pass through on the way to the fluorescent screen. However, a fine mesh of carbon atoms covers the aperture. The spacing of the carbon atoms leads to an interference pattern being displayed on the screen. This cannot be explained in terms of particles and only be described using a wave analogy. They can remain charged at high potentials for long periods of time. Always discharge CRT anodes to outer coatings before handling. Beware of charge recovery. CRTs can redevelop enough charge to provide a nasty jolt when touched. The shock is not the main problem. It is likely you will drop the tube if you receive a shock in this manner. As CRTs are evacuated they are under large pressure from the atmosphere. A crack is liable to cause sudden failure of the glass envelope. Early CRTs are particularly dangerous as the glass tends to fly out over a large distance. Modern CRTs employ implosion protection bands. This may not be obvious as it is the band which supports the front of the tube and mounts the screen in position. These are tensioned by heating before being placed onto the tube and must never be removed. As the tensioning removes some of the stresses on the glass manufacturers have been able to reduce the thickness of glass. As a result any attempt to remove the band can result in instant tube failure. As CRTs operate at very high voltages manufacturers specify the maximum voltages to avoid the production of X-rays. If these limits are exceeded internal shielding may become inadequate.